On Thursday, July 7th, 2011 Mercer County’s fourth annual Summer Project Homelessness Connect was held. 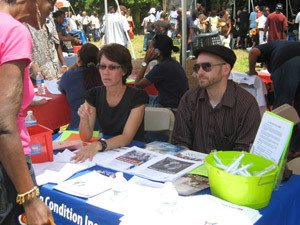 Project Homeless Connect is a one-day event designed to provide housing, services, and hospitality in a convenient one-stop model for people experiencing homelessness. 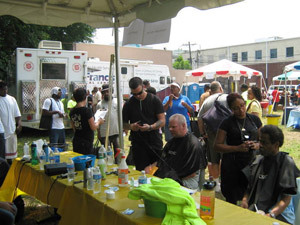 The committee transformed an empty lot into a cookout and service fair for the homeless. It was a very successful (and very hot) day! We used 2100 lbs. of Ice and served over 325 People with 159 volunteers and agencies participating! We are extremely grateful to our three primary financial sponsors of Project Homeless Connect: Bristol Myers Squibb, Janssen Pharmaceuticals and Novo Nordisk. The Beach Towels were provided by United Way of Greater Mercer County Young Leaders. Kingdom Church provided a wonderful donation of clothing and personal care items. Hamburgers, hot dogs, veggie burgers, corn, salad, baked beans, cookies, watermelon and Rita’s Water Ice were served and TaskyCakes and Pretzelcrisps were give away at the exit. Over 30 agencies provided information and giveaways. New this year was the "Socks for America" Initiative to Benefit Families in Need Across the Country. As part of the launch of its innovative "Flex Fit Socks," No Nonsense, a division of Kayser-Roth Corporation, and a leading manufacturer of legwear and sleepwear, donated one million pairs of new socks to children’s charity Kids in Distressed Situations (K.I.D.S.). No Nonsense’s nationwide initiative, "Socks for America," distributed new, comfortable socks to children and their families in need throughout the United States. They stopped at PROJECT HOMELESS CONNECT to distribute socks to the homeless. Also new this year were St. Francis Medical Center’s medical van providing primary medical care; Center for Medicare & Medicaid and Opportunities for All. Returning service providers included: Clipper and Shears; The Paul Mitchell Lab; and local Chiropractor Dr. John Hamada of Acupuncture Chiropractic Healing Arts. The Mercer Alliance to End Homelessness is a public-private partnership implementing a ten-year plan to end homelessness in Mercer County. Information gathered about those experiencing homelessness at Project Homeless Connect plays an important role in our planning. Mercer Alliance to End Homelessness, City of Trenton, Mercer County, and United Way of Greater Mercer County are the leads for Project Homeless Connect. Additional contributors to the event include: Trenton/Mercer Continuum of Care; Rescue Mission of Trenton, Greater Trenton Behavioral Health Care, Johnson & Johnson, Mercer Street Friends, Dr. Cindy Hoge, DDS; Lawrence Rita’s Water Ice and generous individuals. 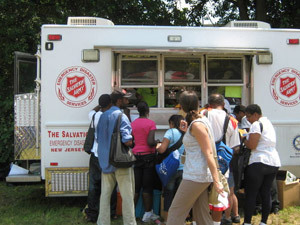 Participating legal, healthcare and social service agencies included: the City of Trenton’s Human Services and Health Departments; St. Francis Medical Van; Mercer County’s Board of Social Services, Department of Human Services; Rescue Mission of Trenton; United Way of Greater Mercer County; Greater Trenton Behavioral HealthCare; Federal Agencies: Social Security Administration, Veterans Administration; Federal Veterans Medical Service; New Jersey HMFA; Henry J. Austin Health Center; Catholic Charities; Anchor House; Escher Street SRO; Mercer Street Friends; Womanspace, Salvation Army; Central Jersey Legal Services, Community Law Project, and Community Justice Center; Capital Health Services-MICU; HomeFront; Child Care Connection;; and Community Innovation’s Trenton Family Preservation House. To see additional pictures from the Summer PHC event press here.